[ABOVE] A silhouette portrait of Sake Deen Mahomed (1759-1851), an Indian-born "Shampooing Surgeon" and proprietor of the "Indian Medicated Vapour Baths" at 39 East Cliff, Brighton (c1828). 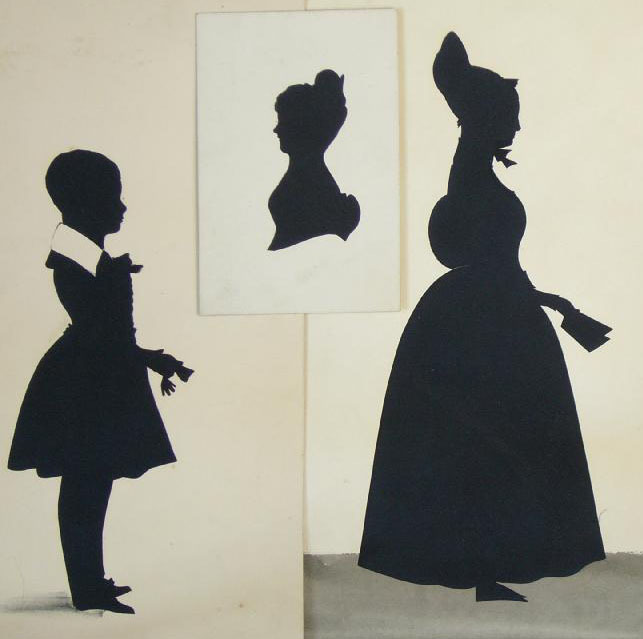 The silhouette likeness has been cut from black paper and pasted on a painted background in the manner of the artist George Atkinson. 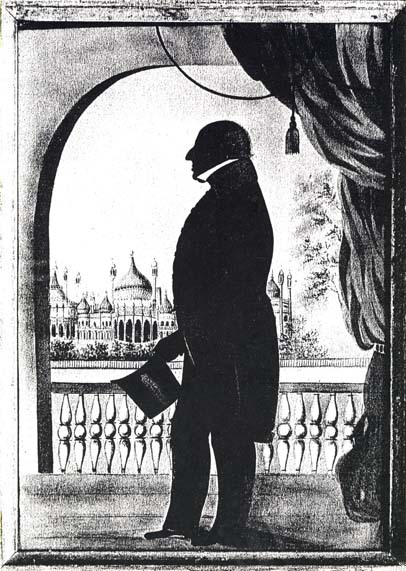 [ABOVE] A silhouette portrait of an elderly gentleman who is pictured standing on the balcony of a building in Brighton's Old Steine, overlooking the Royal Pavilion, the seaside residence of King George IV. (c1825). The elderly man is thought to have been a physician to King George IV during the king's stay in Brighton. 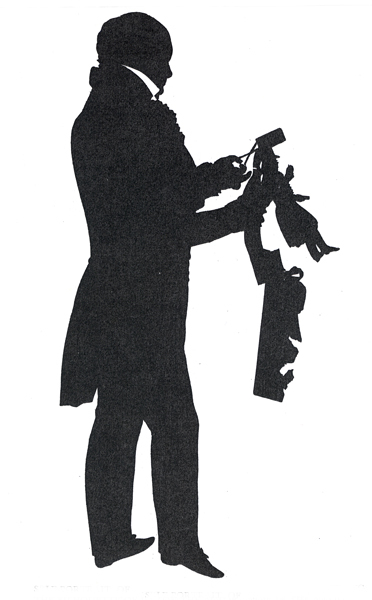 [ABOVE] Self-Portrait of the artist August Edouart in the act of cutting a silhouette portrait from black paper (1828). Augustin Edouart (1789-1861) was a French-born portrait artist who arrived in England around 1814. Edouart spent 15 years touring England, producing thousands of full-length silhouette portraits by cutting profile likenesses from black paper with scissors. For 3 years (1829-1832), Edouart was based in Edinburgh, Scotland. Between 1839 and 1849, August Edouart toured the United States, producing nearly 4,000 silhouette portraits. August Edouart returned to France at the end of his career. 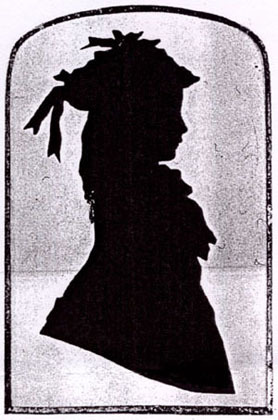 Before the invention and introduction of photography, a silhouette profile cut from black card was the cheapest way of recording a person's likeness. The word "silhouette" derives from the name of a French finance minister, Etienne de Silhouette (1709-1767), who was associated with cost cutting and doing things on the cheap. 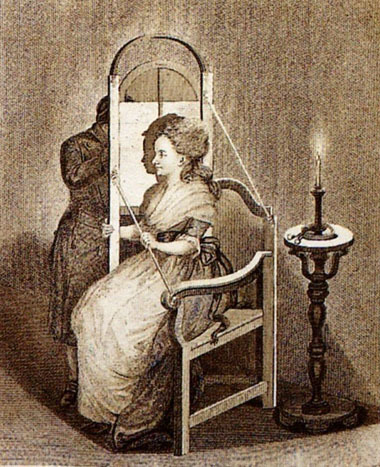 [ABOVE] A Sure and Convenient Machine for Drawing Silhouettes (1792). An engraving from the English edition of 'Essays on Physiognomy' by Johann Kasper Lavater. 1) Painting a filled outline on a light coloured surface - paper, card, plaster etc. 3) Cutting out an outline negative image from light-coloured paper and then placing it on a dark-coloured background. This is known as a "hollow-cut". 2) Using scissors to Cut a profile from a sheet of black card or dark-coloured paper. 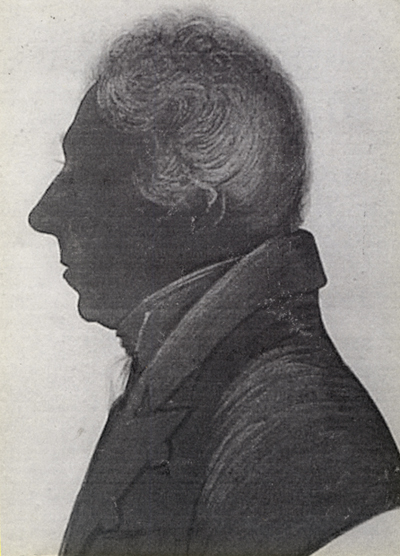 [ABOVE] Silhouette Profile Portrait of Frederick Stahlschmidt (1792-1855) by Edgar Adolphe . Born as Friedrich Ludwig Christoph Stahlschmidt in Hanover, Germany in 1792, Frederick Stahlschmidt settled in England in 1813. Frederick Stahlschmidt was a wealthy Custom House Agent and was a partner in the shipping firm Drolenvaux & Stahlschmidt. When Edgar Adolphe produced this portrait, Frederick Stahlschmidt had his family home in Peckham Grove, Camberwell, South London. 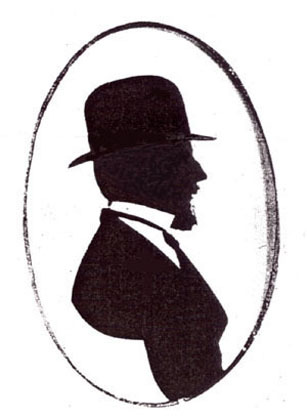 Presumably, the Stahlschmidt family were visiting Brighton when Edgar Adolphe produced a pair of silhouette portraits depicting Frederick Stahlschmidt and his wife, Sophia. 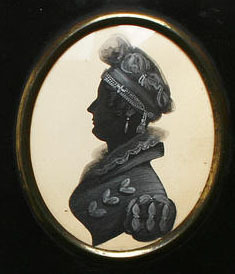 This profile portrait is painted on card with blue-grey highlights. The artist has signed the portrait "Adolphe" below the bust-line. Monsieur Adolphe charged 3s 6d for a bust-length profile. 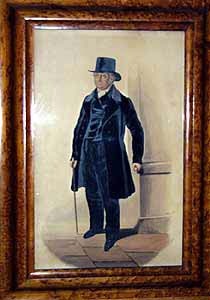 [RIGHT] A small portrait of a gentleman in a blue suit painted by Edgar Adolphe around 1840. As was his custom, Monsieur Adolphe has presented the painted portrait in a maple wood frame. 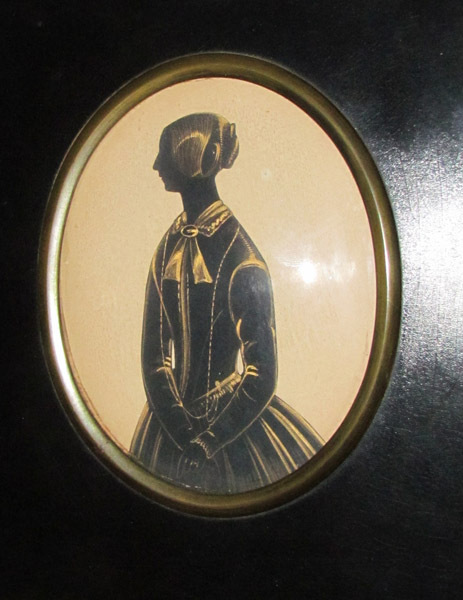 Edgar Adolphe worked as an artist in Brighton for over 7 years, producing miniature portraits, silhouette profiles and small painted likenesses on card such as this one. Brighton & Hove Art Gallery Museum has five watercolour pictures by Adolphe, including portraits of John Giles, Brighton's Town Crier (c1838), Mr Edward Clarke, Riding Master of Brighton, Sarah Ann Hudson (died 1844) and a portrait entitled "Old Martin, Coachman." Edgar Adolphe was born in France around 1808, the son of James T. J. Adolphe, a Captain in the 14th Light Dragoons. It appears that Edgar Adolphe arrived in England around 1832. Adolphe claimed to have been "Miniature Painter and Profilist to Louis Philippe, King of France" so presumably he did not leave France for England until after 1830. [Louis Philippe was proclaimed King of France in August 1830]. By the early 1830s, Edgar Adolphe was working as a portrait painter, miniaturist and profilist in England and Wales. Between 1834 and 1838, Monsieur Adolphe was working as a drawing master in Swansea, teaching calligraphy and the art of painting silhouettes and miniatures. From Swansea in Wales, Edgar Adolphe travelled to the Sussex seaside resort of Brighton, where he established himself as a professional artist specialising in the painting of small full-length portraits, miniatures and profiles. In 1838, Monsieur Edgar Adolphe is recorded as an "Artist" residing at 79 King's Road, Brighton. 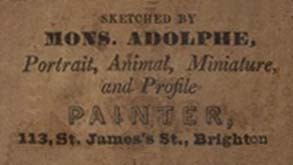 When Leppard's Directory of Brighton and Pigot & Co.'s Directory of Sussex were published in 1839 and 1840, Edgar Adolphe was listed as an "Artist" at 113 St. James's Street, Brighton. It appears that Edgar Adolphe was already married to a French woman when he arrived in England. When the census was taken on on 7th June 1841, Edgar Adolphe and his wife, Eloise, were recorded at a house in East Street, Brighton. On the 1841 census return, Edgar Adolphe is described as an "Artist", aged 32, and his place of birth is given as "France". Madame Eloise Adolphe, Edgar's wife, gives her age as 30 and her birthplace as "France". At a court hearing held some 22 years later, Edgar Adolphe revealed that his wife's maiden name was Eloise Giles. During the early 1840s, Edgar Adolphe was working as an "Artist" at No. 4 East Street, Brighton, a building which Monsieur Adolphe dubbed the "Manographic Institution". 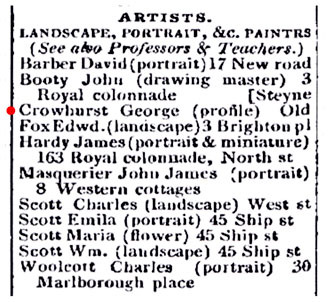 In a Brighton street directory published in 1845, Edgar Adolphe is recorded as a "Portrait Painter" at 4 East Street, Brighton. Edgar's wife, Mrs Eloise Adolphe, is listed in the same street directory as a "Tobacconist" at 4 East Street, Brighton. This was the last time that Edgar Adolphe is mentioned as an artist in Brighton. Edgar Adolphe re-appears as an artist and photographer in Dublin, Ireland, in the mid-1850s. On 15th November 1856, at St Thomas's Church, Dublin, Edgar Adolphe married Margaret Phibbs, the daughter of William H. Phibbs. The registration of the marriage indicates that both the groom and bride told the Registrar that they had been previously widowed, yet there is a suggestion that Monsieur Adolphe's first wife was still alive when the wedding ceremony took place. In 1863, Edgar Adolphe took legal action against his 2nd wife (Madame Margaret Adolphe) for "willfully and maliciously publishing a certain libel on him in a printed handbill." It appears that Edgar's second wife was offering a reward of �50 for information concerning a female who was alleged "to be the former wife of Edgar Adolphe" and who, Margaret believed, was alive when she (Margaret Phibbs) married Monsieur Adolphe in November 1856. (Madame Margaret Adolphe suggested that Edgar's first wife, Madame Eloise Adolphe, had been living under the protection of another artist at the time of her marriage to Edgar Adolphe in November 1856). By 1860, Edgar Adolphe was working as a portrait photographer in Dublin. 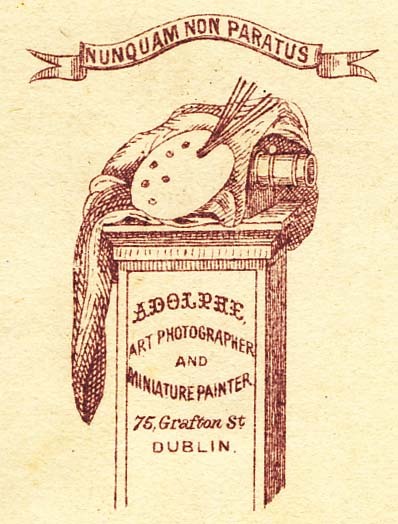 Between 1860 and 1864, Edgar Adolphe was operating a photographic portrait studio, under the sign of the "Golden Palette", at 75 Grafton Street, Dublin. [ In 1864, Edgar Adolphe, described as "a photographer in Grafton Street", wrote a letter to The Dublin Builder, an Irish trade magazine, to complain that Dublin Corporation had made him remove a sign of a "Golden Palette"( which had cost him five pounds) from over his business premises]. By 1878, Edgar Adolphe had removed his photographic studio to 9 Westmoreland Street, Dublin. On 3rd March 1879, Edgar Adolphe married for the 3rd time. Edgar's new wife was Mary Fitzpatrick, the daughter of Edward Fitzpatrick, an Irish farmer. The Marriage Register of St Andrew's Church, Dublin, records that Edgar Adolphe was an "Artist" by occupation and that he was residing at 9 Westmoreland Street, Dublin, the location of the photographic studio known as the "Golden Palette". The death of "Edgar Adolfe" (Edgar Adolphe) was recorded in South Dublin during the 4th Quarter of 1890. Edgar's estimated age at death was 74, yet the former portrait painter and profilist would have been 81 or 82 years of age at the time of his death. [ABOVE] Detail of a Silhouette Profile Portrait of a young woman by Edgar Adolphe (c1840). Adolphe's silhouette portraits were painted in watercolour on card rather than being cut from black paper. Edgar Adolphe often protected his brushwork with wax and sometimes he employed a rounded, convex glass to present his work. Active in Brighton between 1838 and 1845, Edgar Adolphe worked from 79 King's Road (1838), 113 St James's Street (1839-1840) and 4 East Street, Brighton (1841-1845). 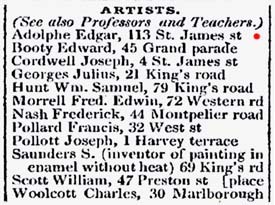 [ABOVE] Monsieur Edgar Adolphe listed as a professional artist at 113 St. James's Street, Brighton, in the 'Professions and Trades' section of Leppard's Directory of Brighton for 1839-1840. [ABOVE] Edgar Adolphe listed as an "Artist" at 113 St James's Street, Brighton, in the Brighton section of Pigot & Co.'s Directory of Sussex (1839). 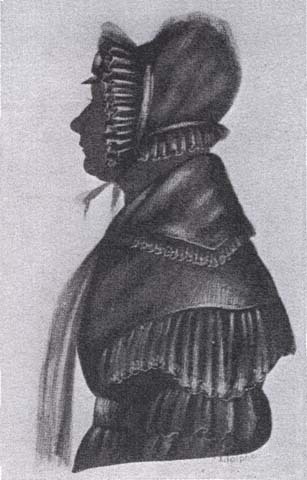 [ABOVE] Silhouette Profile Portrait of a Lady wearing a Bonnet, painted by Edgar Adolphe (c1840). Adolphe often painted his silhouette profiles in a greenish tint, generally highlighting costume details with a blue-grey pigment suspended in gum arabic. Items of jewellery were sometimes painted in gold. As was his custom, the artist has signed the portrait "Adolphe" just below the bottom edge of the portrait. Monsieur Adolphe charged 3s 6d for a bust-length profile like this one. For 5 shillings the portrait could be housed in a maple wood frame. George Atkinson was an artist who originated from London. (An early advertisement declares that Mr Atkinson was "From the Strand, London"). Baxter's Directory of Brighton, published in 1822, records George Atkinson as a "Profilist" at 9 King's Road, Brighton. 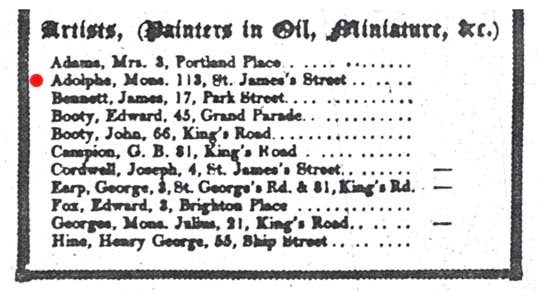 Between 1822 and 1828, local street and trade directories list George Atkinson as portrait painter and profilist at 40 Old Steine, Brighton. By 1824, George Atkinson was claiming to be "Profilist to His Majesty" and trade directories published in 1828 describe Mr Atkinson as "Miniature & Portrait Painter to His Majesty the King" (George IV) and "Profilist to the Royal Family". [On 20th April 1825, George Atkinson published a print of a "Portrait of His Royal Highness, the Duke of York", which had been engraved from an original drawing by "Geo. Atkinson, Profilist to His Majesty and the Royal Family"]. When producing his silhouette profile portraits, George Atkinson preferred to paint on card using a reddish-brown pigment known as "sepia" (the colour was derived from the ink sac of the common cuttlefish, "Sepia" being the Latin name for cuttlefish). Atkinson used a special bronze paint to show details of the sitter's costume and highlights in the hair. The publicity on Atkinson's trade labels informed the public that he specialised in "Bronze and Tint Profiles". George Atkinson's advertisements also mention that his "Method of taking the Likeness is very different from the usual common way, acquired by means of a Camera Obscura", securing a likeness which is "unquestionably correct". Mr Atkinson assured his customers that the time of a profile portrait sitting was "less than One Minute". George Atkinson charged 10s 6d for each coloured profile. 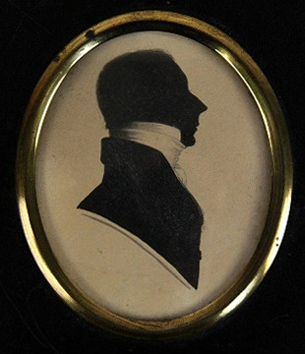 [ABOVE] A Silhouette Portrait of an Unknown Gentleman by George Atkinson (c1820). The profile has been painted on card in sepia brown pigment with highlights in bronze. (See full colour illustration below). 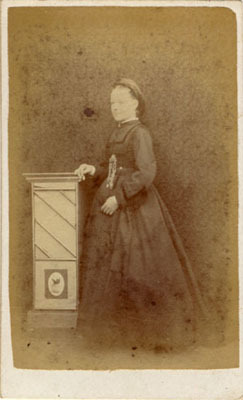 This portrait was taken "at Mr Barker's, Taunton". Atkinson's trade plate states that he was from The Strand, London and that he specialised in "Bronze and Tint Profiles". Mr Atkinson guaranteed "Time of sitting, less than One Minute" and charged 10s 6d for each coloured profile. 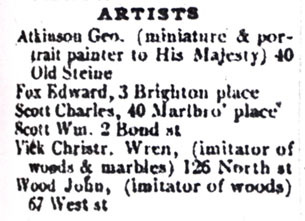 [ABOVE] George Atkinson listed under the heading of "Artists" in Pigot & Co.'s 1828 Directory of Brighton. George Atkinson is described as "miniature & portrait painter to His Majesty" and is shown residing at 40, Old Steine, Brighton. Atkinson was based at 40 Old Steine, Brighton from 1822 until 1828. [ABOVE Inscription on the reverse of the silhouette portrait of the unknown lady illustrated on the left. George Angelo Crowhurst is first recorded in Brighton as a "Writing Master". Local trade directories published between 1823 and 1825 list George Crowhurst as a "Writing Master" in High Street, Brighton. George Crowhurst married Hannah Morris (born c1787) at All Saints' Church, Lewes, on 7th May 1822. When the couple's first child, Hannah Crowhurst, was christened on 22nd February 1823, her father was recorded in the baptism register as "George Crowhurst, Writing Master of High Street, Brighton". George Crowhurst was still described as a "Writing Master of High Street, Brighton" when his second child, a boy named Morris Crowhurst, was baptised on 25th June 1825. By the time George and Hannah Crowhurst's next two children received their baptism at St Nicholas' Church, Brighton the family were residing in Devonshire Street, Brighton. [ Maria Louisa Crowhurst, baptised on 28th February 1828, and George Crowhurst junior, baptised on 6th November 1829]. George Crowhurst was earning his living as a Writing Master when his first four children were born between 1823 and 1829. George and Hannah Crowhurst's fifth child, Raphael Angelo Crowhurst was born early in 1833 and when he was baptised on 13th February 1833, George Crowhurst declared that he was working as a "Profilist" and residing in London Road, Brighton. Pigot's Sussex Commercial Directory, which covers the years 1832-1834, records George Crowhurst as a "Profile Artist" based at the Old Steyne (Steine), Brighton. 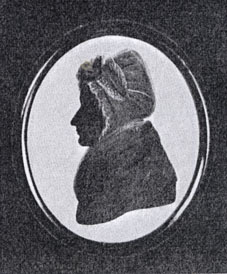 A silhouette group portrait by George Crowhurst, dated 6th February 1834, carries the inscription "George Angelo Crowhurst / Profilist To the King / 40 Old Steine, Brighton". George Crowhurst died in Brighton during the 3rd Quarter of 1839. George Crowhurst listed as a Profile Artist at the Old Steyne (Steine), Brighton, in the 1834 edition of Pigot & Co.s Directory of Brighton. Crowhurst's portraits carry his full address of 40 Old Steine, Brighton. 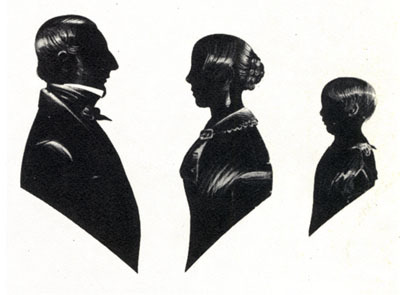 [ABOVE] Silhouette Portrait of a Family Group by George Crowhurst of Brighton (1834). This group portrait which has been painted in colour on card, depicts Edward Ransome and his family. On the reverse of the picture, the artist has identified himself as "George Angelo Crowhurst / Profilist To the King / 40 Old Steine, Brighton. 6th Feby. 1834". John Gapp was a profile artist who worked in Brighton "at the Third Tower in the centre of the Chain Pier" from around 1828 or even earlier. John Gapp cut full-length portraits from black surface paper, which he then pasted on white or light-coloured cards. Mr Gapp would paint a base behind the figure's feet to give the impression that they were standing on the ground. J. GAPP ...continues to produce the most wonderful likenesses in which the expression and peculiarity of character are brought into action in a very superior style. Likeness in Bronze 4s. 0d. Profile to the Bust 1s. 0d. Two of the same as above 1s. 6d. Ladies and Gentlemen on Horseback 7s. 6d. On his trade labels, John Gapp is at pains to point out that "he has no connexion with any other person", which suggests he was trying to distance himself from Edward Haines, his main competitor on the Chain Pier. Edward Haines, who described himself as a Scissorgraphist", also cut profiles on Brighton's Suspension Pier, but he was based "in the first left-hand Tower on the Chain Pier", whereas John Gapp operated initially at P. S. Sampson's Royal Saloon (a small bookshop) and subsequently "at the Third Tower on the Chain Pier". [ABOVE] A full-length silhouette portrait of a woman holding a letter or handkerchief, produced by John Gapp of the Chain Pier, Brighton (c1838). 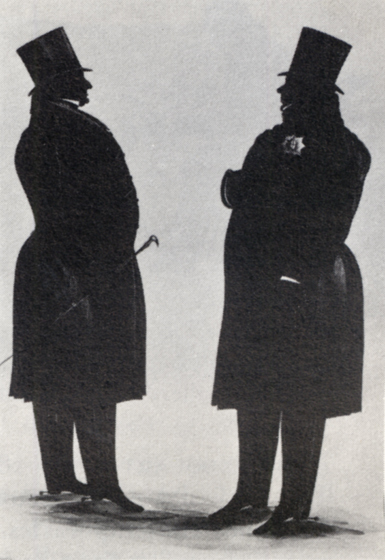 [ABOVE] A pair of full-length silhouette portraits produced by John Gapp (1837). J. GAPP. Daily at the Third Tower on the Chain Pier. Full length, 2s 6d. ; bronze, 4s. ; on horseback, 7s 6d; horses, 5s; dogs, 1s 6d. 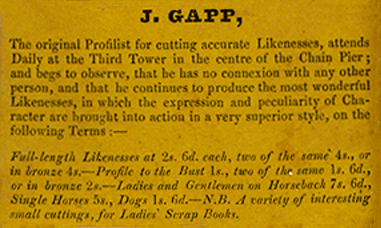 [ABOVE] John Gapp's scale of charges on a label pasted on the reverse of one of his silhouette portraits. [ABOVE] A label taken from the reverse of a full-length silhouette portrait produced by John Gapp at the Third Tower, Chain Pier, Brighton (c1830). 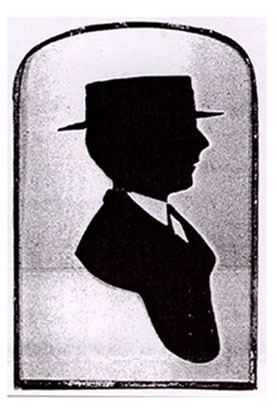 [ABOVE] The publicity on a label pasted on the reverse of a full-length silhouette portrait produced by John Gapp at Sampson's Royal Saloon, Chain Pier, Brighton (c1830). 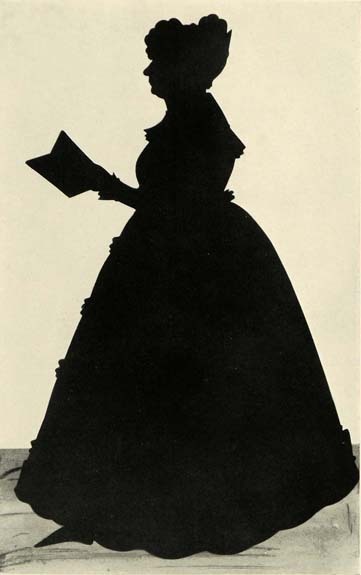 [ABOVE] A full-length silhouette portrait of woman holding a book cut from black paper by John Gapp of Sampson's Royal Saloon, Chain Pier, Brighton (c1830). [ABOVE] Brighton's Royal Suspension Pier, also known as The Royal Chain Pier, as pictured in an engraving produced not long after the Pier was completed in 1823. The view is taken from the head of the Chain Pier looking towards the houses on Brighton's Marine Parade. 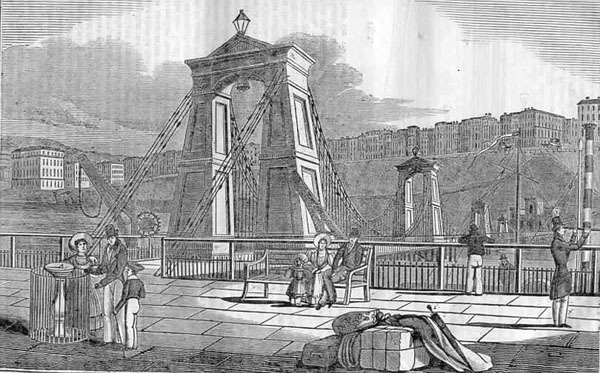 Shortly after the Royal Chain Pier was opened to the public on 25th November 1823, the spaces in the base of the cast-iron towers, from which the iron chains were suspended, were utilised as workshops by artists. 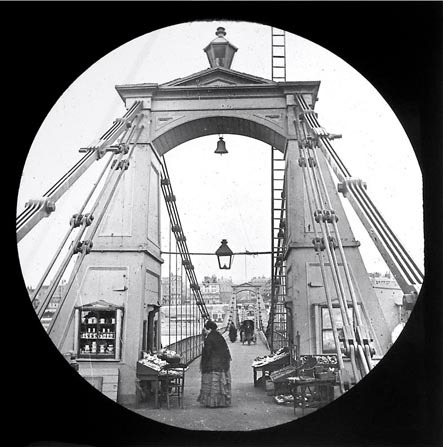 Visitors to the Chain Pier were persuaded by profilists or silhouette artists to have their likenesses taken so that they could have a souvenir of their trip to Brighton. There was a succession of silhouette artists or profilists who operated from the towers on the Chain pier - John Gapp (fl. 1828-1830), Edward Haines (fl. 1830-1866) and George Azariah Lloyd (fl. 1866-1878). A sitting for a profilist would only take a few minutes. 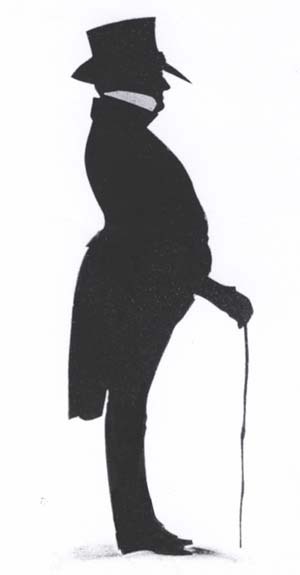 (The silhouette artist, Edward Haines claimed that he could cut "a profile likeness in 1 minute"). The journalist George Augustus Henry Sala (1828-1895) recalls in his memoir Brighton as I Have Known It (1895) the "Old Chain Pier cabins, where they took portraits known as silhouettes which were profiles cut out, apparently of black sticking plaster, stuck on pieces of card." 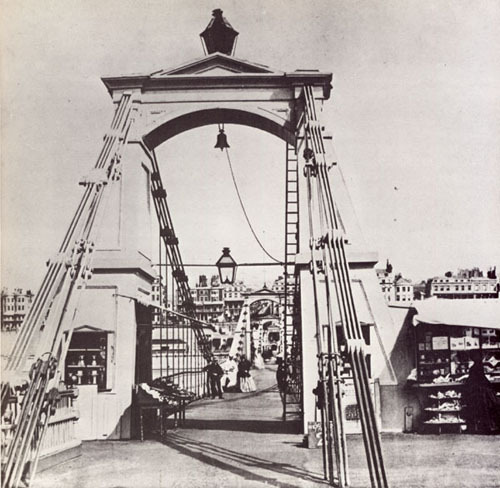 [ABOVE] Chain Pier, Brighton (c1870). A photograph taken from the head of the Chain Pier looking through the arched towers to the Esplanade and Marine Parade. At the base of the iron towers on the Chain Pier were small booths and kiosks, selling gifts and refreshments. The Chain Pier towers were favourite locations for profilists and silhouette artists. In the late 1820s, John Gapp was operating from the "Third Tower", cutting full-length portraits from black paper. The profilist Edward Haines was working from one of the towers on the Chain Pier from 1845 to 1859. George Azariah Lloyd was cutting profiles from Tower No 3 around the time this photograph was taken. Edward Haines was born around 1807 in Yeovil, Somerset, the son of Catherine and Edward Haines senior (died 1840, Brighton). 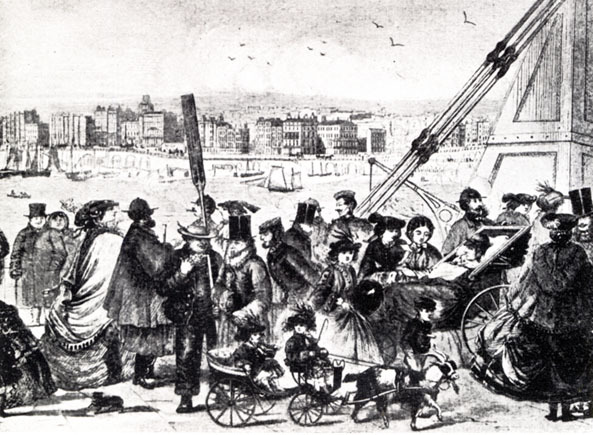 As early as 1824, Mr Edward Haines senior was in the seaside resort of Brighton operating the Camera Obscura on the Old Steine. A Handbook of Brighton, published in 1827, states that the "weighing machine in the first tower of the (Chain) Pier belongs to Mr Haines". An advertisement which appeared in the 1820s also notes that Mr Haines was the proprietor of "two very superior new Pleasure Boats". An entry in Baxter's Strangers' Guide of 1824 also refers to Edward Haines, as the Proprietor of a Toy Shop and Camera Obscura on the Old Steine, Brighton. As Edward Haines junior was only 17 years of age in 1824, we can assume that the toy shop proprietor, the operator of the 'camera obscura' & 'weighing machine' and the owner of the pleasure craft was Edward Haines senior, Edward Shue Haines' father. The Royal Chain Pier, described by many as Britain's first seaside pleasure pier, was opened in Brighton on 25th November 1823. The Royal Chain Pier (officially known as the Brighton Royal Suspension Pier) was very popular with visitors to Brighton, providing a range of amusements and diversions. The cast-iron towers, from which the iron chains were suspended, housed souvenir stalls, small gift shops and kiosks selling fancy articles, confectionery and refreshments. During the 1820s, Edward Haines senior managed a weighing machine in the First Tower of the Chain Pier and operated a camera obscura near the entrance to the Pier. At the Head of the Chain Pier, there was a brick-built camera obscura and a small juvenile library. Around 1828, John Gapp, a profilist who cut likenesses from black paper, established himself as a silhouette artist on the Chain Pier, initially at P. S. Sampson's Royal Saloon (a small bookshop) and subsequently "at the Third Tower on the Chain Pier". Edward Haines junior, who had a strong association with the Chain Pier through his father, Edward Haines senior, began cutting profiles on Brighton's Royal Suspension Pier as early as 1830. 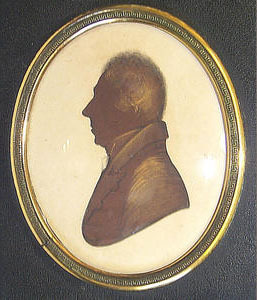 An early example of Haines' profile cutting, which can be dated to around 1831, depicts a silhouette of the murderer John William Holloway, who once worked as a painter on the Chain Pier and was hanged for the murder of his wife on Friday 21st December 1831. Edward Haines junior [also known as Edward Shew Haines] married Mary Ann Hall (born c1811, Brighton) at St Nicholas' Church, Brighton, on 9th February 1829. The couple's first child, Eliza Shew Haines, was baptised at Brighton's St Nicholas Church on 28th March 1830. At the time of her birth, Eliza's father is described as Edward Haines II, a "Profile Artist". Edward Haines and his wife Mary Ann produced a total of nine children. When their 4th child, Mary Ann Haines, was baptised on 2nd January 1836, her father's profession is recorded as "Portrait Painter" and her parent's home address is given as Cumberland Place, Brighton. It appears that when Edward Haines senior died in 1840, his son, Edward Shew Haines inherited his father's various business interests on Brighton's seafront. 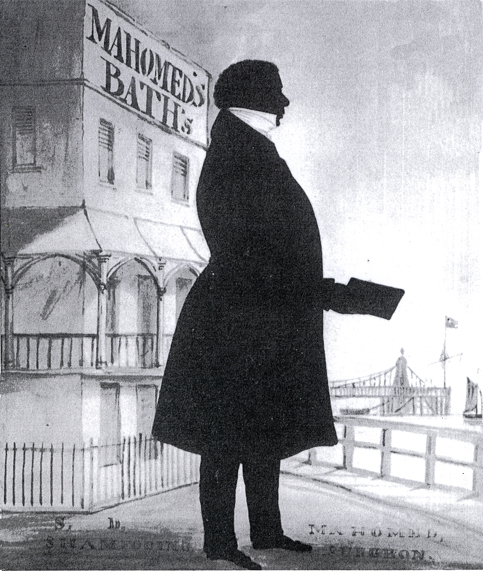 The trade labels which appear on the backs of Edward Haines junior's silhouette profiles refer to the fact that in addition to his work as a "Profilist and Scissorgraphist", Mr Haines was also the proprietor of the "original weighing machine" on the Chain Pier and was the owner of at least two pleasure boats at the "Eastern Entrance to the Chain Pier". Presumably, Edward Haines junior was still in charge of the Camera Obscura at the Chain Pier entrance. In 1845, Edward Haines junior was residing with his family at 2 Devonshire Terrace, Brighton. Brighton trade directories published between 1845 and 1848 list Edward Haines as an "Artist" residing at 2 Devonshire Terrace and a "Profilist" working on the Chain Pier. The Brighton Directory issued for the year 1848 records Edward Haines as a "Profilist" at the "7th Tower on the Chain Pier". Mr Haines must have moved from one tower to another as they became available for rent. In 1840, Edward Haines was based "in the first left-hand Tower on the Chain Pier", but other sources refer to Mr Haines as the "skilled silhouette cutter at the second Tower". When the census was carried out on 30th March 1851, Edward Haines was described as a "Profilist", aged 44, living at 6a Cavendish Street, Brighton, with his forty year old wife, Mrs Mary Haines, and 6 of their 9 children. The 1851 census return also records that Edward Haines the Profilist was deaf. This is supported by an anecdote relayed by John Woodiwiss in an article entitled 'Brighton Silhouettists': "Haines was exceedingly deaf and, on being asked any question, invariably replied 'One and sixpence, head and shoulders; two and six, full length' ". Melville's Directory of Brighton, published in 1858, records Edward Haines as a "Profilist & Photographer" on Brighton's Chain Pier. 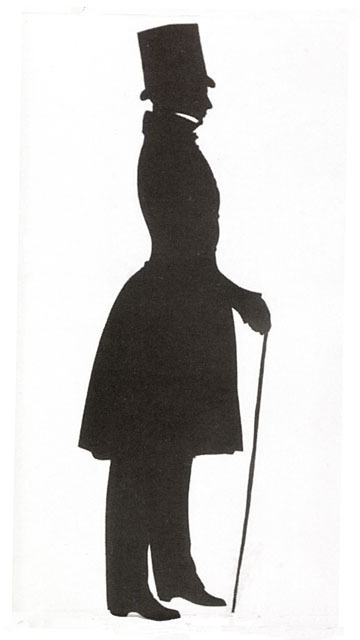 Like other profilists, such as Edgar Adolphe and George A. Lloyd, Edward Haines had to turn to the new art of photography when the demand for silhouette likenesses declined in the 1850s and 1860s. At the time of the 1861 Census, fifty-three year old Edward Haines was residing at 331/2 Liverpool Street, Brighton with his wife and five of his children. On the census return Edward Haines is described as an "Artist". Edward Haines died in Brighton during the 3rd Quarter of 1866. Profilist and Scissorgraphist, patronized by the Royal Family, most respectfully informs the nobility and gentry and visitors of Brighton, that he continues to execute the peculiar art of cutting profile likenesses in 1 minute, with the aid of scissors only, so as to equal any yet produced by the most accurate machine. Portraits of many interesting living characters may be seen in the first left-hand Tower on the Chain Pier. Families attended at their own residences without additional charge. Proprietor of original weighing machine. E. Haines begs most respectively to return his grateful acknowledgements to the Ladies, Gentlemen and visitors of Brighton for the very liberal support he has received as a Profilist, and begs to inform them, he has just started two very superior new Pleasure Boats at the Eastern Entrance to the Chain Pier, with steady and experienced men. E. H. respectfully solicits a continuation of these favours, which shall be his constant study to deserve. N.B. These boats are admirably calculated for family parties, fishing parties, or excursions, being well provided with everything requisite and may be engaged at any time by applying to E. H. on the Chain Pier. [ABOVE] The publicity of Edward Haines, Profilist on the Chain Pier, Brighton, as printed on a label pasted on the reverse of one of his framed silhouette portraits (c1850). Edward Haines has taken the opportunity to advertise his pleasure boats which he hired out to the public. 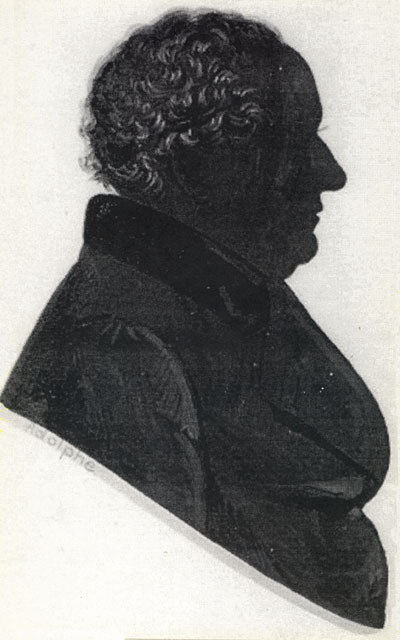 [ABOVE] A woodcut copy of a silhouette profile portrait of the murderer John William Holloway (1806-1831) by Edward Haines of the Chain Pier, Brighton (c1831). This print illustrated a broadsheet detailing the execution of John Holloway for the murder of his wife, Celia Holloway. [ABOVE] An engraved print showing a crowd on the Chain Pier in February, 1859. On the right can be seen one of the cast-iron towers on the Chain Pier which served as kiosks and small shops. Edward Haines operated as a profilist from "the first left-hand Tower on the Chain Pier". [LEFT] An early advertisement for the young profilist/ silhouette artist Edward Haines junior (1807-1866), placed in a local directory by his father, Edward Haines senior (died 1840), the proprietor of the "Original Weighing Machine" on Brighton's Chain Pier. 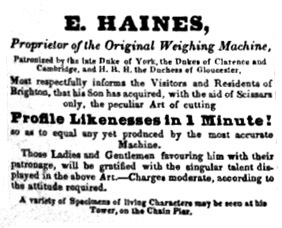 In the advertisement, Edward Haines senior informed the reader that "his Son has acquired, with the aid of Scissors only, the peculiar Art of cutting Profile Likenesses in 1 Minute". The advertisement ends with the words: "A variety of living Characters may be seen at his Tower, on the Chain Pier". George Azariah Lloyd was born at 2 Queen Street, Westminster, London on 25th March 1821, the son of Mary Ann and James Lloyd, a carpenter and builder. George was baptised at St James's Church, Westminster, some ten months later on 13th January 1822. George had at least two siblings - Mary Ann Lloyd (born 1818, Westminster) and Frederick Edwin Lloyd (born 1824, Westminster). There is evidence that George Azariah Lloyd was working as an artist during the 1840s. In 1846, George Azariah Lloyd, then aged 25, fathered a child. The baby boy was named "George Azariah Lloyd" after his father. George Azariah Lloyd junior was born in Staines, Middlesex on 19th September 1846. On George junior's birth certificate, George Azariah Lloyd's's occupation is given as "Artist". A couple of years later, on 4th December 1848, George Azariah Lloyd married fellow artist Elizabeth Clark (born c1827, Coventry, Warwickshire) in the city of Bristol. Elizabeth Clark was the daughter of Elizabeth and John Carter Clark, a watchmaker from Coventry and was Christened in Coventry on 24th February, 1828. On their marriage certificate, George Azariah Lloyd and his bride Elizabeth Clark are both described as artists. 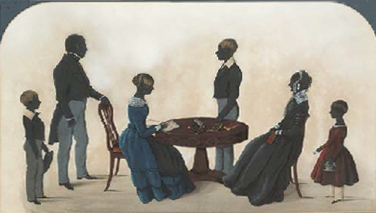 George Azariah Lloyd earned a living by making portraits either by painting likenesses or, more usually, by cutting profiles from black paper. It appears that as a young man, George Azariah Lloyd earned his livelihood as an itinerant or a travelling artist. In the mid 1840s, George Lloyd was working as an artist in the London area. At the time of his marriage in 1848, George Lloyd was in Bristol. A son, William Lloyd, was born in 1849, when George and Elizabeth were living at Lichfield in Staffordshire. By 1850, the Lloyds were back in the Bristol area. A daughter named Elizabeth Lloyd was born at Clevedon, near Bristol around this time. When the 1851 census was taken, George Azariah Lloyd and his family were recorded at an address in Plymouth St Andrew in Devon. George A. Lloyd is described as an "Artist" on the 1851 census return. Sometime between 1851 and 1853, the Lloyds returned to Somerset and had made their home in the district of Bedminster, one mile south of the city of Bristol. George's fourth child, Mary Ann Lloyd, was born at Bedminster in 1853 and another daughter, Emily Lloyd was born at Regent Road, Bedminster in 1856. By 1861, George Azariah Lloyd and his family were living in London, where a son Thomas Lloyd was born. The 1861 census records George A. Lloyd and his family at 22 Princes Row, Westminster, London. George Lloyd gives his profession as "Artist" and his wife Elizabeth is described as a "Nurse". Six children are listed on the 1861 census return - George (junior), aged 14, William, aged 12, young Elizabeth, aged 10, Mary Ann, aged 8, Emily, aged 5, and baby Thomas. After a period as an itinerant artist, George Azariah Lloyd settled in the Sussex seaside resort of Brighton around 1863. 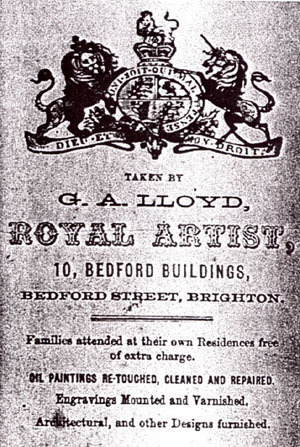 G. A. Lloyd is recorded as a "Profile Artist" based at 10 Bedford Buildings, Bedford Street, Brighton. [ABOVE] The Trade Label of George Azariah Lloyd, which declared he was a "Royal Artist " residing at 10 Bedford Buildings, Bedford Street, Brighton (c1866). In 1938, the Brighton & Hove Herald reported that George Azariah Lloyd, was "a notable character in Brighton", noting that he "was known as the �Royal Artist� of the Chain Pier, and was commissioned to go to London and paint the portraits of Queen Victoria and members of the Royal Family." [ABOVE] The Chain Pier, Brighton. A nineteenth century lantern slide showing a close-up view of one of the cast iron towers on Brighton's Chain pier. There was a space at the base of each tower which could be utilized as a kiosk, small shop or artist's workshop. As this photograph shows, the towers of the Chain Pier housed small shops selling toys, books, prints, confectionary, jewellery, gifts and souvenirs. During the 1860s,the artist George Azariah Lloyd was based at one of the Chain Pier towers, where he cut profile portraits from black paper for the holiday-makers who promenaded along the length of the Chain Pier. The towers had accommodated profilists and silhouette artists since the pier was built in 1823. George Azariah Lloyd was one of several artists who worked as profilists or silhouette cutters on Brighton's Chain Pier in the mid 19th century. It appears that Lloyd was creating "profiles" on the Chain Pier in the mid 1860s. 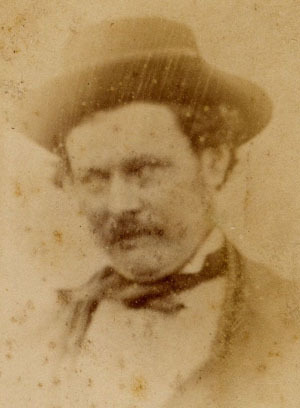 A couple of years later, around 1868, Lloyd added photography to his more traditional portrait making skills. G. A. Lloyd is listed as a "Photographic Artist" at 3a Chain Pier, Brighton in the Brighton trade and street directories published in1868 and 1869. George Azariah Lloyd was probably still living in Brighton in the early Summer of 1869, when the marriage of his son George Lloyd junior took place in the town. [George Azariah Lloyd (junior) married widow Mrs Jane Angelina Brown in Brighton on 5th July 1869]. By early August 1869, George Azariah Lloyd was working as a "Photographic Artist and Profilist" in the West Sussex seaside resort of Littlehampton. In the first ever issue of The Littlehampton News, dated 7th August 1869, Lloyd announced that he was making portraits at premises "next door to Mr Staples' Fancy Shop", located near the Congregational Church in Littlehampton. By 1871, George Azariah Lloyd was back in Brighton. At the time of the 1871 census, George Lloyd was living with his wife Elizabeth and four of their children at 10 Bedford Buildings, Kemptown, Brighton. George Lloyd is recorded as a "Photographer" on the census return. Emily Lloyd, George's fifteen year old daughter, is described as an assistant in her father's photography business. There had been two additions to the Lloyd family since their arrival in Brighton - James Lloyd (born 1863) and John Lloyd (born 1865). At the end of February 1873, George Lloyd applied to the Brighton Watch Committee for permission to have a stand on Brighton seafront, "where he may earn a livelihood by cutting profiles". On 3rd March 1873, the Brighton Watch Committee came to the conclusion that "the application cannot be entertained" and refused Lloyd's request. After the rejection of his application for a licence in Brighton, George Lloyd moved on to Worthing, where he briefly operated as a photographer at 23 North Street, Worthing. The 1874 edition of The Post Office Directory of Sussex lists George Lloyd as a photographer at North Street, Worthing. [LEFT] The signature of George Azariah Lloyd as inscribed in ink on the reverse of a carte-de-visite photograph he took around 1873. 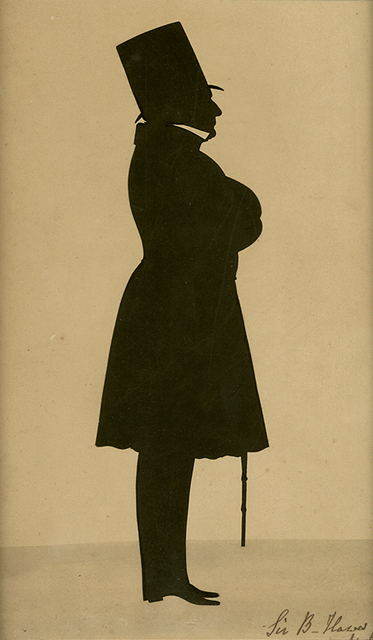 George A. Lloyd , Edward Haines and Edgar Adolphe, together with other profile artists, turned to photography when the demand for silhouette likenesses fell. After a short period in Worthing, George Lloyd and his wife returned to Brighton. On 21st March 1878, George's wife, Elizabeth, died in Brighton at the age of 50. Elizabeth Lloyd had been paralysed and had died from tubercular meningitis at the Brighton Workhouse Infirmary. At the time of Elizabeth's death, George Azariah was earning his living as a "Profilist". The 1881 census records George Lloyd as a widower, living at the Lambeth home of his younger brother Frederick Edwin Lloyd (born 1824, Westminster), who had also recently lost his own wife, Emma Lloyd (c1834-1879). Frederick Edwin Lloyd (entered as 'Edwin Lloyd' on the census return), the Head of Household at 2 Newport Street, Lambeth, was employed as a maker of gas lamp shades and was providing for four motherless children, whose ages ranged from ten to two. George Azariah Lloyd is described on the census return as an "Artist in Paintings", aged 60. While living in London, George Azariah Lloyd made the acquaintance of a widow named Ann Newton, who was eventually to become his second wife. George Azariah Lloyd married Ann Newton on 24th December 1884 at St Andrew's Church, Canal Road, Hoxton, in the London district of Shoreditch. On the marriage certificate, sixty-three year old George gives his profession as "Portrait Painter". George Lloyd, accompanied by his second wife, returned to live in Brighton. Towards the end of his life, George Lloyd lived at 4 Sussex Terrace, Brighton. Early in 1900, George Lloyd was admitted to the Infirmary attached to the Brighton Workhouse in Elm Grove. George Azariah Lloyd died of bronchitis and bladder cancer in the Workhouse Infirmary on 11th February 1900, at the age of 79. 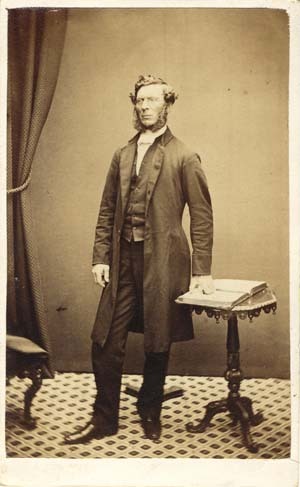 [ABOVE] A photographic portrait, believed to be that of the profilist and photographer George Azariah Lloyd (1821-1900). 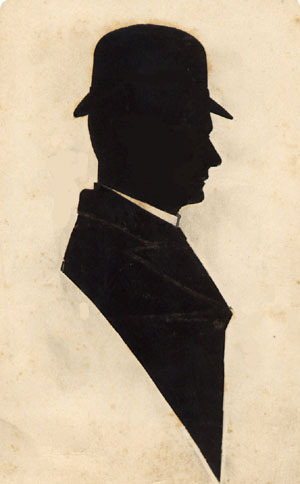 [ABOVE] A Profile Silhouette Portrait of a Man wearing a bowler or derby hat, cut from black paper by George Azariah Lloyd of Brighton. 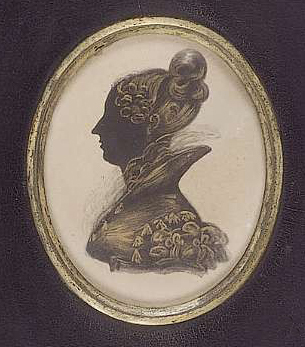 [ABOVE] A Profile Silhouette Portrait of Naomi Fuller (1841-12) attributed to George Azariah Lloyd of Brighton. [ABOVE] Carte-de-visite portrait by George Azariah Lloyd (c1873). 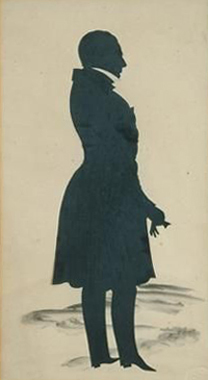 [ABOVE] A Silhouette Portrait of an Unknown Man, the father in a family group cut from black paper by George A. Lloyd of Brighton (c1866). 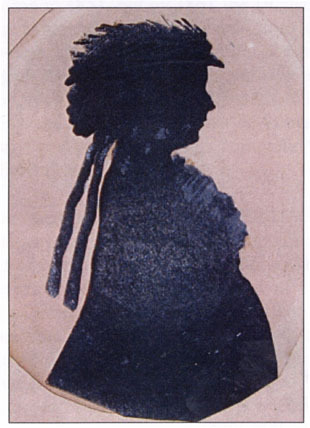 [ABOVE] A Silhouette Portrait of an Unknown Woman, the mother in a family group cut from black paper by George A. Lloyd of Brighton (c1866). 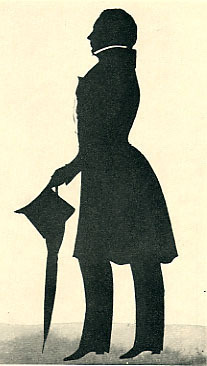 [ABOVE] A Silhouette Portrait of a Boy wearing a low-crowned hat, the son in a family group cut from black paper by George A. Lloyd of Brighton (c1866). 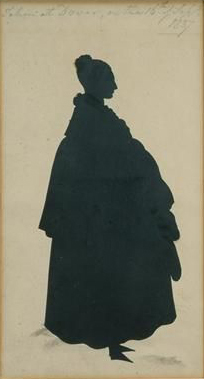 [ABOVE] A Silhouette Portrait of a Girl wearing a decorated hat, the daughter in a family group cut from black paper by George A. Lloyd of Brighton (c1866). J. Neville Most respectfully informs the Visitors and Inhabitants of Hastings, that he has taken Apartments at Mr Payne's, Pastrycook, High-street (Hastings). Profile Likenesses in Black, Bronze, and Colours, from ONE SHILLING to ONE GUINEA; and, for Correctness, not to be equalled by any in the Kingdom. Around 1830, J. Neville arrived in Brighton, taking up temporary residence at 4 Pool Lane, Brighton. It appears that although the artist originated from London, he would tour the seaside towns of Sussex and the provincial towns in East Anglia during the summer season. 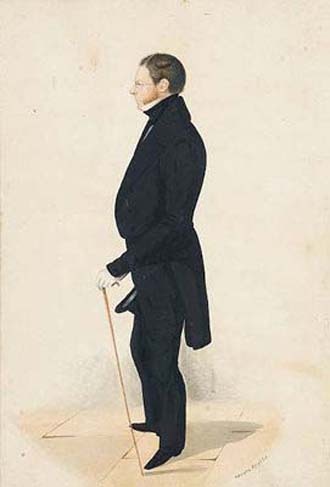 J. Neville painted his profile portraits in watercolour on black card, favouring shades of blue-grey and using "Chinese White" pigment to heighten fashion details and provide highlights. Neville generally painted bust-length portraits, but full-length likenesses are known. Neville's trade labels which appear on the reverse of his silhouette portraits provide evidence that he was a London artist who made seasonal tours of East Anglia and the southern counties of England. One label indicates that when Neville painted one particular portrait he was working in a room attached to Mr Read's hairdressing shop which was located on the "corner of Westgate Street, near Corn Hill, Ipswich". [ABOVE] Silhouette profile portrait of Isabella Keiskamma Frend Child (1829-1902) by an unknown artist. 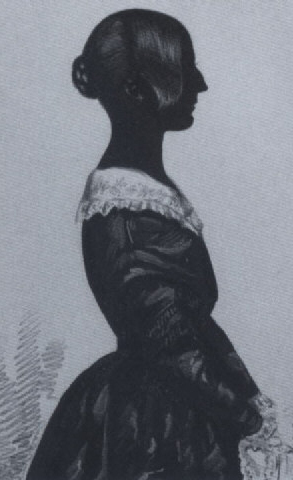 This profile portrait was made around the time Isabella K. Frend married Octavius Child (1826-1858), a former officer in the Indian Navy. Isabella Keiskamma Frend was born on 5th July 1829 at Fort Wiltshire, Cape of Good Hope, South Africa, the daughter of Ellen Last and Captain Albert Frend, an officer in the 55th (Westmoreland) Regiment of Foot. Isabella Keiskamma Frend married Octavius Child at St Nicholas Church, Brighton on 13th August 1852. 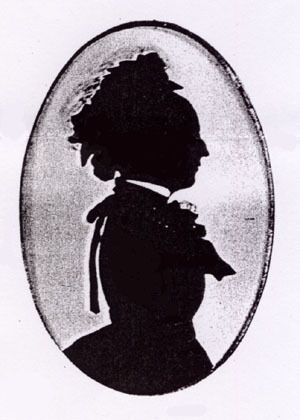 This silhouette profile portrait of Isabella was probably made around the time of her marriage in 1852. At the time of the 1851 Census, twenty-one year old Isabella Frend was living with her adoptive mother Mrs Emily Clulow at 4 Western Terrace, Brighton.